ssistance League of the Chesapeake is a 501(c)(3) nonprofit, volunteer organization that gives kids in need the tools for success. We fund our philanthropic programs with membership dues, community support and generous donations from individuals and organizations. All donations stay in Anne Arundel County, benefiting adults and children in need. We are proud to be a GuideStar Exchange Gold Participant! Review the Nonprofit Report on Assistance League of the Chesapeake provided by GuideStar Exchange. Support Assistance League of the Chesapeake through Amazon Smile. Please register your favorite charity, that would be Assistance League of the Chesapeake of course. Every time your have an Amazon order please place your order through smile.Amazon.com. Assistance League of the Chesapeake receives a credit and Amazon will increase its AmazonSmile donation to us. It’s another painless way to support our chapter. Please contact info@alchesapeake.org if your company is interested in becoming a sponsor of Assistance League of the Chesapeake. Assistance League gratefully acknowledges the following corporations and organizations that have supported us with generous grants. “I have been volunteering in a Title 1 school for twelve years. After retiring from government work, I decided I wanted to be involved with helping children in some capacity. 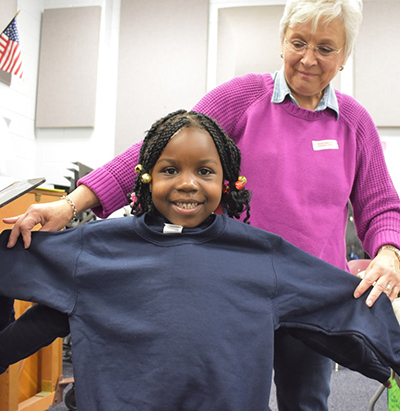 A news article led me to learn about Assistance League of the Chesapeake. They were just starting volunteer programs in Title 1 schools—just what I was looking for. I walked in cold to a meeting—not knowing a person there. Not only did I find the perfect volunteer opportunity, but I discovered a group of like minded ladies and made some wonderful friendships. “Still another program brings puppets to schools to teach how to deal with bullying—an important topic today. One puppet has a learning disability and ‘learns in a different way.’ It is heartwarming to witness children talking to these puppets and taking in their message.